Thanks for liking The People's Choice. Like TIME on Facebook for more trusted news analysis, award-winning multimedia & behind-the-scenes looks with TIME editors. As always, TIME's editors will choose the Person of the Year (in the Dec. 26, 2011, issue of TIME, on sale Dec. 16), but that doesn't mean readers shouldn't have their say. The tallies of our annual poll, below, show which notable people from the past year have received the most yes votes and which have generated the most no's. 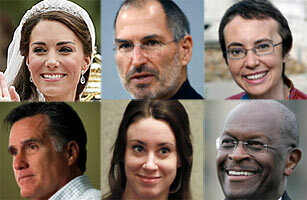 Next Who Should Be TIME's Person of the Year 2011?